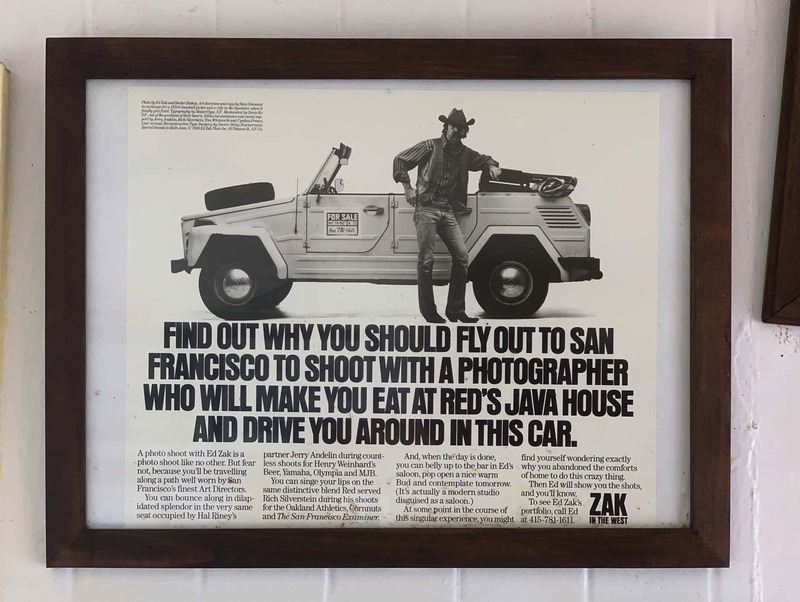 I found that hanging at Red’s Java House and wanted to learn more about Ed Zak. I mean, with ad copy like this, how can you not want to know more? Find out why you should fly our to San Francisco to shoot with a photographer who will make you eat at Red’s Java House and drive you around in this car. A photo shoot with Ed Zak is a photo shoot like no other. But fear not, because you’ll be traveling along a path well worn by San Francisco’s finest Art Directors. You can bounce along in dilapidated splendor in the very same seat occupied by Hal Riney’s partner Jerry Andelin during countless shoots for Henry Weinhard’s Beer, Yamaha, Olympia and MJB. You can singe your lips on the same distinctive blend Red served Rich Silverstein during his shoots for the Oakland Athletics, Cornnuts, and The San Francisco Examiner. At some point in the course of this singular experience, you might find yourself wondering exactly why you abandoned the comforts of home to do this crazy thing. Then Ed will show you the shots, and you’ll know. To see Ed Zak’s portfolio, call Ed at 415-781-1611. Photo by Ed Zak and Becker Bishop. Art direction and copy by Steve Diamant in exchange for a 1950’s baseball jacked and a ride in the Speedster when it finally gets fixed. Typography by MasterType, S.F. Mechanical by Denis Ko, S.F., out of the goodness of their hearts. Editorial assistance and moral support by Jerry Andelin, Rich Silverstein, Tom Whitworth and Cynthia Franco. Last-minute Reconstructive Type Surgery by Doctor Betsy Zimmerman. Special thanks to Red’s Java. © 1988 Ed Zach Photo Inc, 80 Tehama St., S.F. Ca. Photographers are usually pretty easy to find on the internet, but Ed Zak was a bit of a mystery. He filed papers of incorporation with the state of California in 1969, corporate number C0572650. The address in the filing matched the one in the copyright notice in the ad, but I was stuck with just that for a while. There will be an informal gathering in front of his place in South Park sometime in April. Contact Wade at the South Park Cafe for more information. Edward Zak died peacefully on February 19, 2014 in San Francisco, California. He was 76. Ed was born on August 10, 1937 in Alliance, Ohio to Hilda Wilhelmina Zak and Edward William Zak. I would still be very interested to see Ed Zak’s portfolio.